AIPAC’s on the ropes – but this weekend it could get a big boost from an unlikely source. House Speaker Nancy Pelosi is going to be speaking at their annual conference. That’s right, at a time when AIPAC’s power is clearly waning and we are watching change happen in real time – with groups like MoveOn coming out strongly in favor for Democrats to skip AIPAC – Nancy Pelosi is lending her legitimacy to them. Add your name to call on Speaker Pelosi to #skipAIPAC. Amongst AIPAC’s all-star line-up of anti-Muslim, anti-Palestinian speakers, one of the country’s most powerful politicians will be speaking. This is appalling. Anyone who values justice, equality and freedom for Israel/Palestine should not be endorsing AIPAC. AIPAC’s morally bankrupt decisions have never been more clear. First they condemned Netanyahu’s partnership with the far-right Kahanist “Jewish Power” party and then flip-flopped and invited him to speak at their conference. Instead of speaking at their conference Nancy Pelosi should be publicly condemning the far-right shift in Israel and AIPAC’s dangerous political behavior. Giving AIPAC cover right when progressives are finally responding to their constituents and turning away from AIPAC is simply the wrong thing to do. 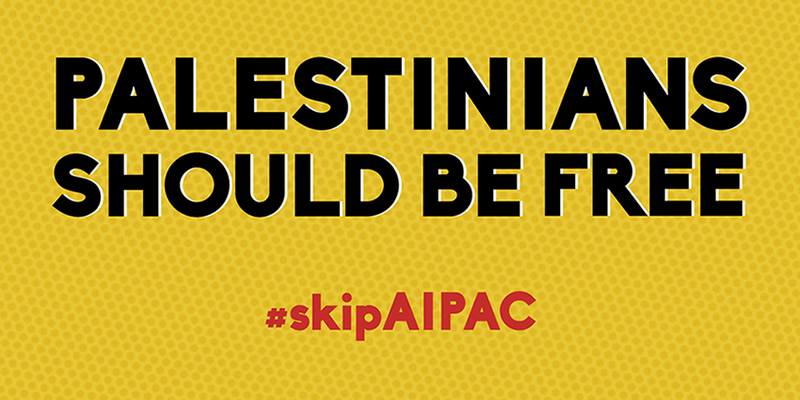 Will you join us and add your name to call on Speaker Pelosi to #skipAIPAC? We’ve been able to sway Pelosi before when she was piling on an attack of Rep. Ilhan Omar’s critique of AIPAC, and we can do it again.